When you create a folder for your use you may want to monitor what has got changed in the folder over a period of time. If yes then look no further, FolderDiff is a free tool that you can use to monitor the changes in your folder structure over a period of time. FolderDiff creates a list of all files and folders including the sub folders and then saves that folder structure. 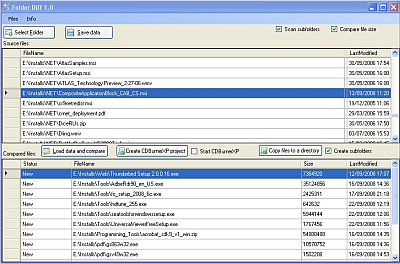 The saved folder structure is used to for later comparison, from which you can find new or changed or modified files over a period of time. The new or changed or modified files can be copied to some other folder. The files can be also exported to CDBurnerXP project format that you can use to directly burn CDs or DVDs. Many of you would already be using CDBurnerXP so this will be an added advantage of this utility. This utility requires .NET framework to be installed for proper functioning.